Testimonies in worship help people hear real-life examples of how God is at work. It’s another voice giving glory to God during worship. When someone stands to give God praise informally, everyone can join in praise. Hearing someone else proclaim God’s faithfulness can evangelize a lost person. Testimonies help believers get to know one another better. I’ve spent a week hearing great sermons at Beulah Camp in Eldorado, IL. During one service, Mark Nysewander, one of the camp preachers, invited people to share a testimony. This is a succinct and simple way to help make impromptu witness during worship successful. Of course, there are other times when someone may prepare and share a longer testimony more formally. Testimonies can also be shared via video, which can be effective for controlling the time factor with a bonus that it can be spread to a wider audience. But when you’re inviting people to share during worship, these ABC’s really help put a focus on the purpose. Testimonies during worship haven’t been utilized as much now as they used to be, and I think it’s in part because of time constraints. People tend to talk too long, about too many parts of their story. We want to give people time to share, but it’s most effective when these three components are there: 1) It’s about Jesus, 2) It’s brief and to the point 3) It’s something they are currently learning or experiencing. What about your church – do you utilize impromptu testimonies from the congregation during worship? Could it work in your context? 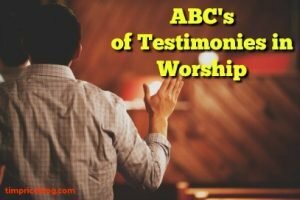 Do people need a chance to share a testimony in worship?